Player of the Day—Alcantara struck out six over eight scoreless innings, allowing four hits and no walks, in the 3-0 win over the Rockies. Alcantara earns 2.0 Box-Toppers points for being Player of the Day, his first points of the season and ranks seventh in Box-Toppers season player rankings. American League Player of the Day—Tigers pitcher Matt Moore struck out six over seven scoreless innings, allowing two hits and one walk, in the 3-1 win over the Astros. National League Batter of the Day—Christian Yelich of the Brewers homered, doubled and went 2-for-2, scoring twice and driving in three runs, in the 5-4 win over the Cardinals. 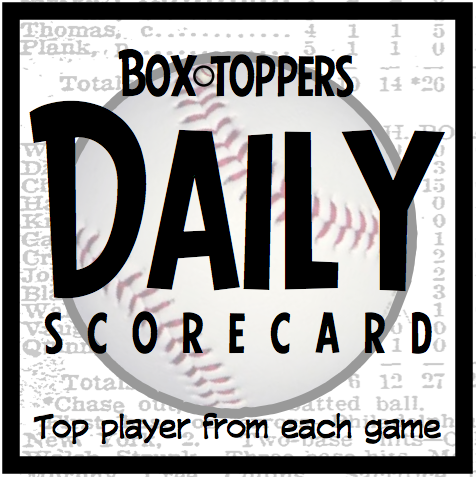 Yelich earns 1.5 Box-Toppers points for being NL Batter of the Day, his first points of the season. He led NL batters in 2018 with 11.5 points. American League Batter of the Day—Renato Nunez of the Orioles hit a three-run homer and went 2-for-4, scoring twice and driving in three runs, in the 7-5 win over the Yankees. This was Nunez’s Box-Toppers debut, the first time in his career he earned Player of the Game honors. Nunez made his Major League debut Sept. 12, 2016, and was playing in his 93rd career game. New Box-Toppers points leader—Cody Bellinger of the Dodgers rises to first place in Box-Toppers season player rankings after earning Player of the Game honors Sunday for the second straight day. Bellinger (HR 3-5 3R BI in the 8-7 win over the Diamondbacks) earns 1.0 Box-Toppers point, giving him 2.7 for the season. Seven other players have 2.0 points. Bellinger was NL Player of the Day Saturday. He earns back-to-back Box-Toppers Player of the Game honors after going all of 2018 without earning Box-Toppers Player of the Game honors, despite playing in all 162 games. Bellinger had 8.7 Box-Toppers points in 2017, 10th among NL batters. Streak—Asdrubal Cabrera of the Rangers has now earned Box-Toppers points in 13 straight seasons after earning Player of the Game honors in the 11-10 win over the Cubs (HR 2-3 R 3BI). Cabrera earned his first Box-Toppers point in 2007 with the Indians and has 50.2 career points, 16th among active AL batters. His best season was 2011 with the Indians, when he had 14.7 points, first among AL batters. That was an anomalous year because in his second-best season he had more than 10 fewer points—4.5 in both 2008 and 2009. In 2018, he had 3.5 points with the Mets and Phillies. Padres pitcher Chris Paddack (5IP 2R H BB 7K ND in the 3-1 win over the Giants) also made his Major League debut Sunday. Omar Narvaez of the Mariners (HR 2-5 2R 3BI in the 10-8 win over the Red Sox) made his Major League debut July 17, 2016, and was playing in his 225th career game. Notable—Bryce Harper earned his first Box-Toppers point as a member of the Phillies Sunday after earning Player of the Game honors. Harper (HR 2B 2-3 R BI in the 5-1 win over the Braves) signed a 13-year, $330 million free agent deal in the offseason with the Phillies. He earned 41.9 Box-Toppers points with the Nationals from 2012 to 2018. His 42.9 career points ranks 23rd among active NL batters. Scoring—Alcantara earns 2.0 Box-Toppers points for being Player of the Day and Moore earns 1.7 points for being AL Player of the Day. Yelich and Nunez each earn 1.5 points for being their league’s Batter of the Day. All of Sunday’s other Players of the Game (listed in the chart below) earn 1.0 Box-Toppers point.